Scoliosis is an abnormal curvature of the spine involving a sideways bend (lateral curve). Normal Alignment of the Spine (left) and Scoliosis (right). The spine is normally straight (when viewed from the front) and a balanced set of curves (when viewed from the side). Scoliosis is an abnormal sideways bend in the spine but is often associated with rotation and forwards bending. 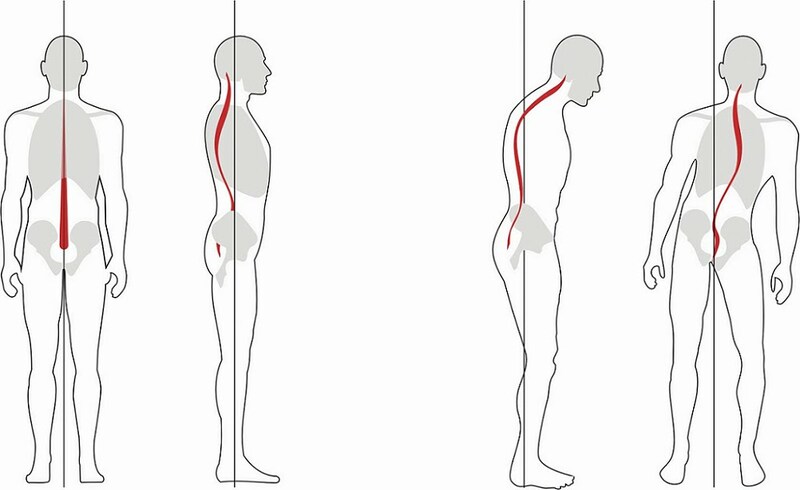 There are many causes of scoliosis. Two of the most common types are adult degenerative scoliosis and adolescent idiopathic scoliosis. Dr Ball operates on adults with scoliosis. Do you need an operation ? 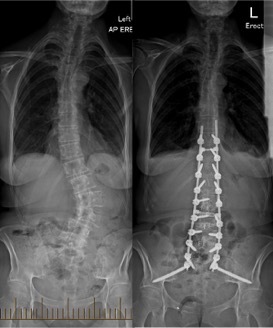 Xrays of the Spine before and After Surgery for Scoliosis. Surgery is considered when there are severe symptoms or progressive deformity. The decision to have surgery should depend on the severity of your symptoms and your ability to tolerate them. The impact of these symptoms should outweigh the potential impact and risks of surgery. Surgery for scoliosis is a major undertaking. Each procedure is tailored to the patient’s specific circumstances. The following description is general. You will be given a general anaesthetic so that you are unconscious throughout the procedure. Spine Access : An incision is made in the back and the muscles on either side of the spine are dissected from the spine. Pedicle Screw Instrumentation : Screws are placed in the bone on either side of the spine (pedicle). There are normally two screws at each level (one on the left and one on the right).These provide an anchor in each bone of the spine. The screws are sometimes cemented in the bone to provide additional strength. Decompression and Release : The bone at the back of the spine (spinous processes and lamina) is removed from the spine to take pressure off the nerves (laminectomy) and loosen up the bones (osteotomy). Sometimes the discs are cut to further release the bones. Reduction of Deformity : Rods are cut and bent to the proper shape for the patient’s spine. The screws are pulled to the rods so the bone line up along the rods. Interbody and Posterolateral Fusion : The discs between selected vertebrae are removed and interbody cages and bone graft are placed in these spaces. Further bone graft is placed on the back of the spine. Bone graft : The bone removed during surgery is normally used as bone graft. If this is insufficient, a bone substitute or bone growth protein may be used or additional bone taken from your pelvis or the bone bank. 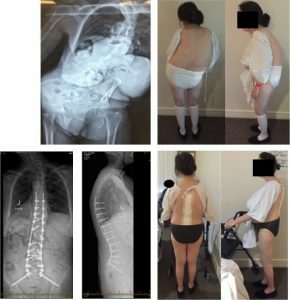 A 63 year old female had severe scoliosis with pain and postural difficulties (upper images). Surgery was performed to correct the scoliosis (bottom images). At the end of the operation, local anaesthetic is injected to provide additional pain relief. The wound is closed with a dissolving suture under the skin. The general anaesthetic is stopped and you will wake up and be taken to the intensive care unit. Most patients stay in hospital up to 10 days. Most patients will benefit from a period of inpatient rehabilitation and this can be organized during admission. It may take many months to recover from this sort of major surgery. Click here to download an information brochure on scoliosis.